The LightStream PJD5253 makes a big statement with its elegant style and price defying audiovisual performance. Its curvaceous design, which includes a tactile keypad and non-slip foot pads, also presents an intuitive and user-friendly interface. Exclusive SuperColor™ and SonicExpert™ technologies provide some of the best visual and audio performance in their class. The PJD5253 boasts a 3,200-lumen lamp with a 15,000:1 contrast ratio, delivering clear and bright images for small to medium meeting rooms or classrooms. 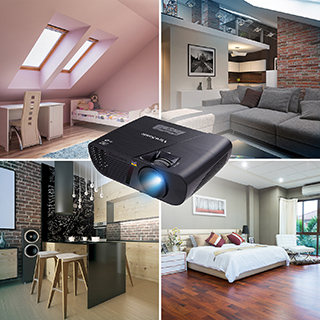 Supporting 2 x VGA, Composite Video, S-Video, and 1 x VGA output, as well as Audio in/out, Mini USB and RS232, this projector has flexible connectivity with analog-based equipment. DynamicEco™ further reduces power consumption by up to 70% and extends the lamp life by up to 10,000 hours. 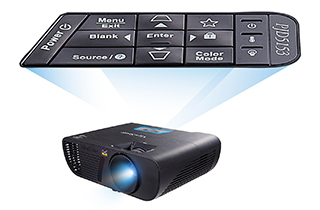 With its matte finish and curved edges, this LightStream Projector stands out from the competition. A tactile keypad provides ease of use with raised and concave buttons, plus a central reference button. These assist in making set up easier in dark environments or if the projector is ceiling mounted. ViewSonic’s exclusive SuperColor™ Technology delivers superior colour range than competitor projectors, ensuring that users enjoy more realistic and accurate colours. With an exclusive colour wheel design and dynamic lamp control capabilities, SuperColor™ Technology projects images with true-to-life colour performance in all scenarios, also reducing eye fatigue in bright and dark images. 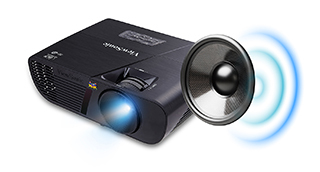 Following groundbreaking and exclusive speaker developments - transducer and chamber re-design - LightStream projectors deliver superior audio performance than competitor projectors. The compact yet powerful speakers sound stronger and enable sound to travel further, powerful enough to fill your meeting room with wall-to-wall sound. Packed with 3,200 lumens the PJD5253 is guaranteed to produce bright images in any environment – even in rooms with high ambient light. The high contrast ratio of 15,000:1 also ensures that dark and bright areas are more black and white and less grey in appearance. * Applicable power cord is shipped with the projector to the point of destination (European and UK power cords must be included for VSE shipment).